The fundraiser comes as Bloomberg announced he would be contributing $20 million to the Senate Majority PAC, which aims to help Democrats capture a majority. Republicans said the fundraiser is evidence that Bredesen is out of touch with Tennessee voters. "Voters are seeing just how much Phil's word is worth: zilch," Tennessee GOP Chairman Scott Golden told the Washington Free Beacon. "Only two weeks ago Phil Bredesen was touting his supposed love for the Second Amendment, but now he's running up to New York to get money from the nation's most ardent gun-grabber, Michael Bloomberg. Phil clearly cares more about liberal elites' cash than the values held by Tennesseans." "This is a good reminder that Phil Bredesen will sell out Tennessee values in a heartbeat if it means some extra campaign cash," NRSC Spokesman Michael McAdams said in a statement. "Tennesseans want a senator who will stand up for their Second Amendment rights and Bredesen's upcoming fundraiser shows his support for their values is up for sale to the highest bidder." The fundraiser also comes after Bredesen was criticized by the National Rifle Association for touting an outdated A rating in a campaign ad. 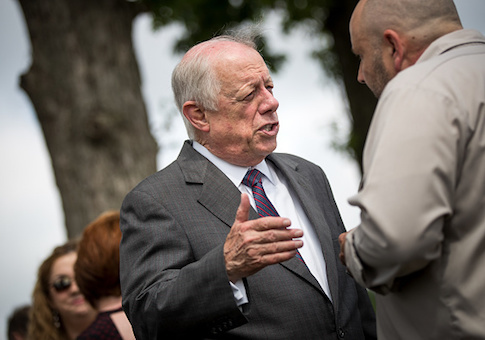 The gun rights group demanded Bredesen retract his ad. "It's not 2002, you're not governor and you're not A-rated by the NRA," Cox tweeted at Bredesen in response to the ad. "It's 2018, you have earned a D rating for turning your back on self-defense and supporting the Hillary/Schumer/Bloomberg gun control agenda. @VoteMarsha is a 2A champion. You're not." The NRA endorsed Bredesen's Republican opponent Marsha Blackburn late last month calling her "a champion of our Second Amendment freedoms." The Bredesen campaign did not immediately respond to a request for comment. This entry was posted in Politics and tagged 2018 Election, 2nd Amendment, Guns, Phil Bredesen. Bookmark the permalink.